It is about Mutton Kawsha of the last century famously reputed 'kasha mangsho', one of the signature dish of Kolkata, first presented commercially by the New Punjabi Hotel popular as “Golbari” situated at Shyambazar five points established by late Ratan Arora around 1915-1920 still available the original dish there with some other specialties, a slow-cooked dark-brown dry mutton curry served with soft ghee-smeared chapattis, vinegar pickled onion rings and tamarind chutney. In that era no other meat serving eatery was to be found nearby. Few sweetmeat shops and some other fry shops were the primary occupants. Hence golbari has always encountered large crowd count for its food right from the start. In the beginning the shop served the usual chicken curry. One day the shop was overturning with hungry customers. The chicken was just getting cooked and dried only in oil 'kasha' then. Curry was far to be seen. The hungry customers matched their voices and yelled for whatever has been prepared by then and the meat was served that way giving birth to the ever-TO-BE-famous "Golbari'r kasha mangsho". It was priced at 60 paisa then which has now become 140 rupees. The original outlet at Shyambazar five-point crossing. New Punjabi Hotel. a semi circular house named “Gol meaning round” “ Bari meaning House” at 211, Acharya Prafulla Chandra Road, Kolkata – 700004 now have brunches at Ripon Street and Kankurgachhi Kolkata. 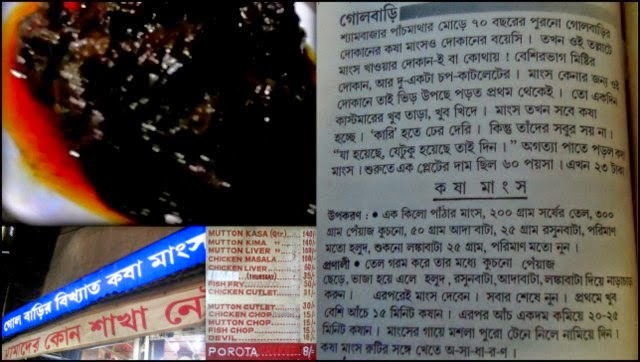 A meal for two at Golbari’s would cost around Rs 400 (taxes extra) reputed for a special Bengali dish, a dark rich gravy with loads of oil around the plate and a few pieces of Mutton or goat meat. Marinade mutton with tamarind juice, 2 teaspoon turmeric, 2 broken bay leaves, coriander powder, 1 teaspoon chili paste and 1 teaspoon salt for 15 minutes. Heat oil in a pan, take out 2 teaspoon oil and keep aside. Add the chopped onion in the hot oil and cook till golden brown. Add the garlic and ginger paste, turmeric powder, chili paste and a little water and cook. Add the mutton, fry until oil oozes out and steam for 20 to 30 minutes on low flame. Now check if the mutton is properly cooked or not let the curry to dry in the oil. Beat the curd with 2 teaspoon oil, add garam masala powder, salt and 1 teaspoon sugar in it, beat well, now add to the cooked mutton, cook for another 10 minutes. The famous Kolkata mutton koshwa will be ready by then. 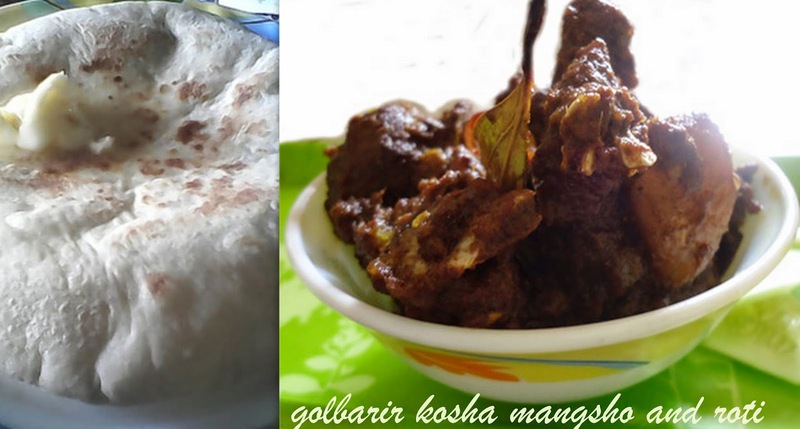 Serve hot curry with just made roti, paratha or phulko luchi.